For those of you who do not follow me on facebook you might not be aware of the recent drama in my life. It started in the summer when my new friend Tanya and I started training together. She was new to open water. New to swimming in fact. She is a student of my friend Kate who is a fabulous swim instructor for adults. 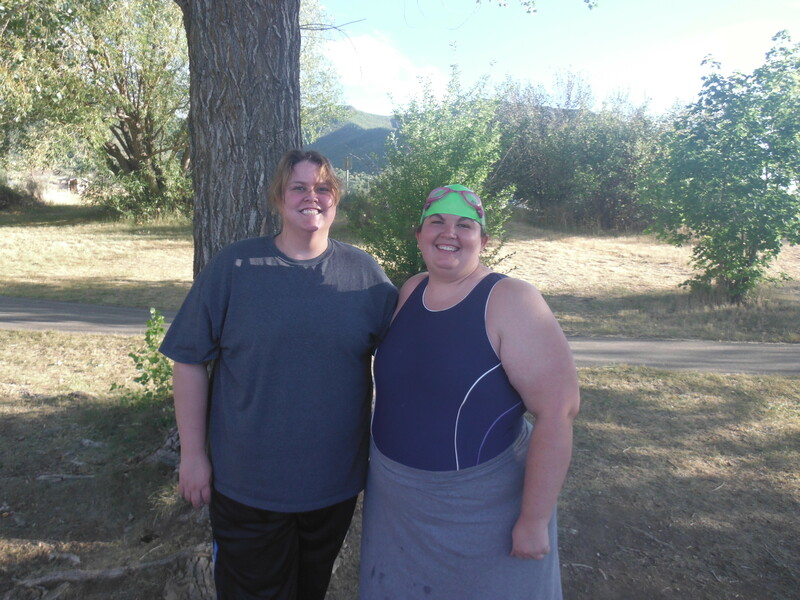 She’s introduced so many people to swimming and open water over the years and has helped me tons with my own stroke. In July Tania mentioned to me that she wanted to prepare for a race but didn’t feel she would be ready for Deer Creek in August. The next obvious choice was to take the trip out to Slam the Dam in Las Vegas at the beginning of October. I have done this race in 2011 and it was a lot of fun. I figured why not? (I had signed up last year but various dramas kept me from attending). So the training began and we got to blackridge pond as often as we could and we both saw improvement. More importantly we had fun and became dear friends. Tanya is honestly good for my ego because she thinks I’m such a good swimmer. I love to swim but pretty much always know I’m the slowest girl in the room and I’m ok with that. I get the job done and that’s all that matters to me. I’ve told Tanya repeatedly over these weeks ‘this is a hobby. If it isn’t fun you are doing something wrong’. That said, I’ve had nagging doubts about my abilities all along. With my back and other chronic pain I haven’t been able to train as hard as last year, it was frustrating for me to feel like I wasn’t the swimmer I was just a few months ago. These anxieties were made worse by the realization of a strict time limit at Slam the Dam. For some unknown reason the park service would only give them until 11 am and then everyone has to be done. This only gives the 1.2 mile swimmers 1 hour to swim. The organizers have told me it is ‘plenty of time for a swim’ but they don’t understand or aren’t interested in nurturing new/nontraditional athletes. My best time on a 1 mile swim is 53 minutes. At Deer Creek my time was 1 hr 2 minutes for 1 mile. But where’s the victory in that? I’d say there is about a 50/50 chance depending on weather, current, course, strength, stroke etc that I finish the race. My GSL time after all was 1 hr 24 minutes so not even close to the cut off time because of the strong current. (Thank you Utah races for not having a time limit or at least a strictly enforced one). 50/50…so I either succeed and have a triumphant moment or I get a DNF (Did Not Finish). Even now there is a side of me that shudders when I say those words. It is so outside of my nature to not finish, and yet isn’t it always a possibility in any endeavor? At least anything worth doing can be a success or failure? How do you guys deal with DNF’s and potential failures in your goals? Its especially hard when it is so outside of your control. What are your strategies? I’ve gotten some great encouragement on facebook from the swim forums. Thanks everyone! Shawn C Turner the worst that happens is a dnf (eh!) and a boat might pick you up before the finish (or race officials ask you to swim out near a feed station, depending on course layout). if you don’t mind the drive and want to swim the race, i say go for it. Laura Leahy Go for it. Sarah Green and – think how stoked you’ll be when you do make it. Carol Schumacher Hayden Go for it and swim like he**. Laura Leahy If you don’t go your letting someone else control the outcome. Rachel Wagner I think what has made me worry is the organizers sent an email saying “If you are not adequately prepared mentally and/or physically, do not race”. I never feel adequately prepared. Certainly not mentally. Shawn C Turner i think they mean swimmers who might take the race for granted, or who don’t know what they’re getting into. they’re not talking about you. your objective in this race is that time limit; you’re close. concentrate on your technique, keep some gas in the tank, and when you feel you can kick it up a gear toward the end, go for it! Suzie Dods They also say that to protect themselves. You wont know unless you try. If nothing else you’ll have a grand road trip! GO!! Isa Bird Which category are you doing? It looks like they have as many kayaks as swimmers! Go for it, what an experience and as others have said, enjoy the journey and have FUN. Respect! Kelly Grace Winters Go for it Rachel! I am having a similar thing about a triathlon I’m supposed to do next weekend. I have an illness that prevented me from doing much training over the summer, so I am not exactly going to cruise through the thing. But what the heck! Go and do it anyway, and enjoy the day. Feel proud of yourself for giving it a go and doing the best you can. Ann Schuette Apple Do it!!!!! You have trained for it and looked forward to it. Worth the drive because if you didn’t do it you wish you had for much longer than 7 hours. GOOD LUCK!!!!!! Charlotte Herrera Plummer Do It!!! Floyd Fisk Go for it and don’t worry if you don’t make the time limit (my bet is that you will). The statement in the emai is there to protect the race organizers and for those who are inexperienced in open water swimming. You have the experience as shown by your 6 previous swims. I’m sure you will do great. 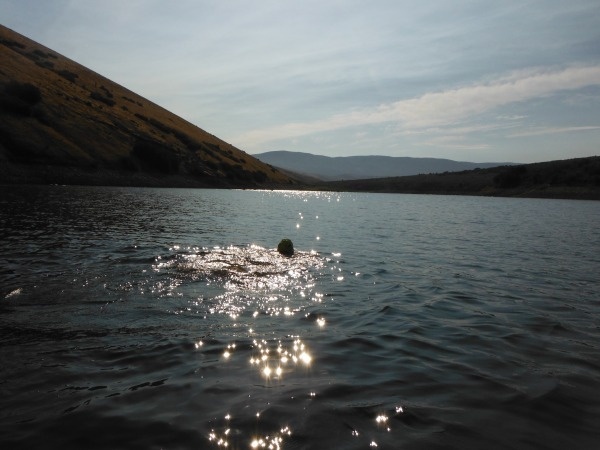 I will be there too and this will be my longest OW swim (2.4+1.2). Good luck! really going to pull you out? I wouldn’t. I like your perspective–DNF=DNQ. Sure it’s embarrassing for them to pull you out, but you’ll get over that quickly. If you’re anything like me (and I think you are) you’ll be more disappointed in yourself for not trying than you’d be embarrassed if you tried and failed. All of that being said, take care of yourself. If you are too worked up and anxious (the clinical type not the average type) and in too much physical pain, skipping it is not the end of the world. I understand your frustration, but I wouldn’t hold it against the race organizers and boycott future races. Having been on the organization side of open water events, there is a lot going on behind the scenes that participants don’t usually see. I know the STD organizers and they are good people who care as much about beginner swimmers as they do about “elite” swimmers. They offer a lot of clinics and training programs specifically geared towards new open water swimmers and triathletes. I’m sure they would like to extend the time limit so that everyone can finish, but to get their permits they have to do what the NPS says. If they don’t follow the NPS rules, they risk losing permits in the future. I believe there was an issue last year with a swimmer who refused to get out after the time limit and that is what caused the NPS to strictly enforce the cut-off time. Another consideration is volunteers. It’s hard to get enough volunteers to staff a race, let alone finding volunteers willing to stay late. We have been pretty flexible with the cut-off times at our races because the park rangers have not been as strict about enforcing them. You will probably find that we are the exception to the rule and that most other races are much more strict about their cut-offs. I have no doubt that you can swim the distance. Gordon said he was going to be working with you over the next couple weeks to see if he can help get your speed where it needs to be to finish the race under the limit. Just go down and do your best and have fun. If you finish under the time limit, awesome! If you end up being pulled, use it as motivation to train harder for next year. If you ever want to do a swim where you don’t have to worry about time limits, let me know and I will come paddle for you. The more I thought about it I shouldn’t be so critical of people who are volunteering their time. I was just feeling sad and nervous. Sorry about that. Thanks Josh. You are right. It was the fault of the permits and not the organizers I should have made that more clear. I guess it was the email the organizers sent that seemed a little exclusionary of new swimmers. I mean how does a new swimmer know “mentally and physically” that they are ready for something they’ve never done before and yet they are told to “not race” if they don’t feel prepared? I’ve done 6 and never feel ready. That said, you are right they have been kind to me in other ways. Its really the situation that frustrates me more than the people. I was so hoping my friend would have a positive experience like my first swim but it just hasn’t worked out that way, which makes me sad. She’s worked very hard and it makes me sad. Plus, I do feel anxious about my time and wish I could just swim it without worrying but I guess that’s not my style. Realizing I could live with a DNF was huge for me as far as anxiety goes. Mostly I just have to let my pride go and accept my best efforts but that’s hard for me. Gordon and I are swimming tomorrow. That was super nice of him. You guys are always so giving and kind. I really appreciate it. When I said I probably wouldn’t race in slam the dam again it is more the distance and risk in not finishing isn’t worth it. If I had read the rules more carefully I wouldn’t have signed up to begin with. Its a long way to drive to fail. The strange thing about me is I seem to have about the same time no matter my training. I have never gotten below a 53 minute mile (even my 5ks were 54 minute miles). I will be curious to see what Gordon has to say in my stroke because I’m sure there are many areas I could speed up. Thanks for offering to paddle for and having such faith in me. It means a lot.